iCaddy HD and iCaddy Pro include the ability for your Club to incorporate local weather information into your App. 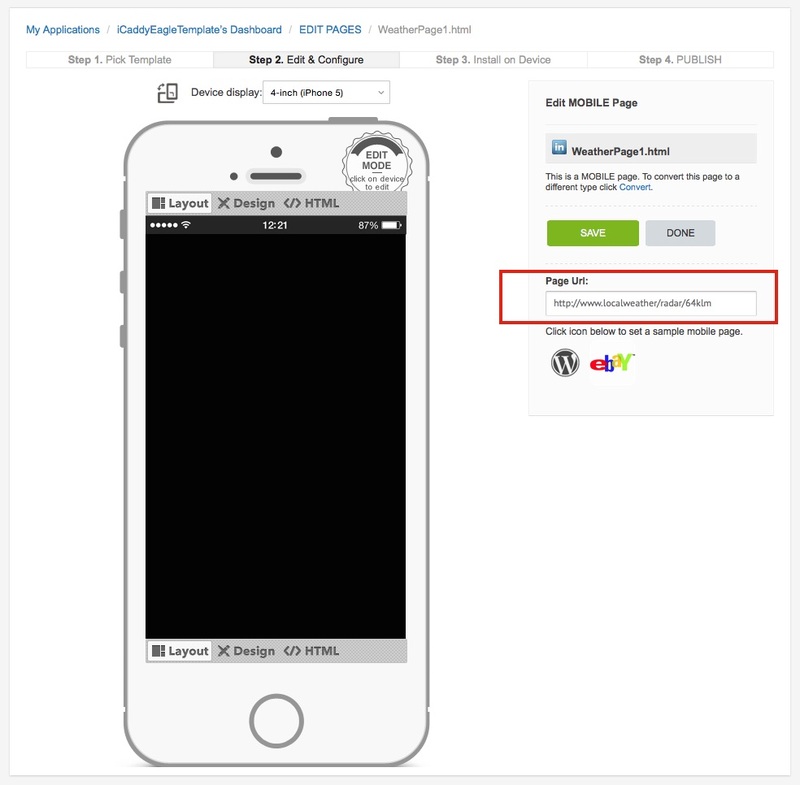 This feature can be accessed via a link to a relevant website (e.g. weather information service), or by a incorporating a HTML 'Weather Widget' into your App's 'Weather Page'. 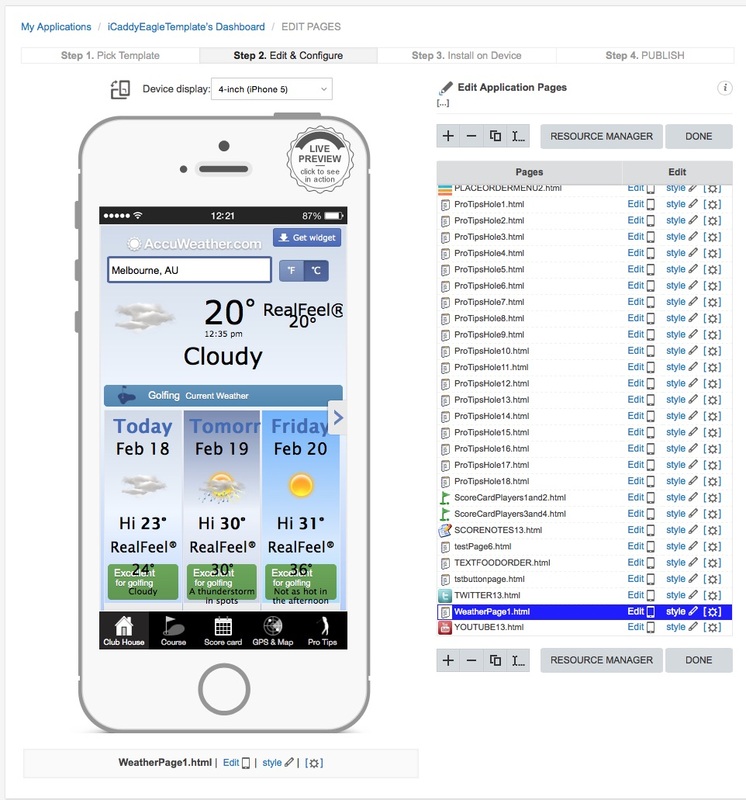 The following tutorial explains how to enable weather information in your App. Link the 'Weather Page' to a Website. The iCaddy HD and iCaddy Pro templates include a page ready to link to your choice of weather service (i.e. WeatherWidget.html). Simply enter the URL (e.g. http://www.localweather/radar/64m.html) for your selected weather webpage in the 'Page URL:' field (as shown above). Note:If your Club already has a weather information page incorporated into your Club's website, link the 'Weather Page' in your App to it here. Alternatively, link the page to your preferred weather information service provider. 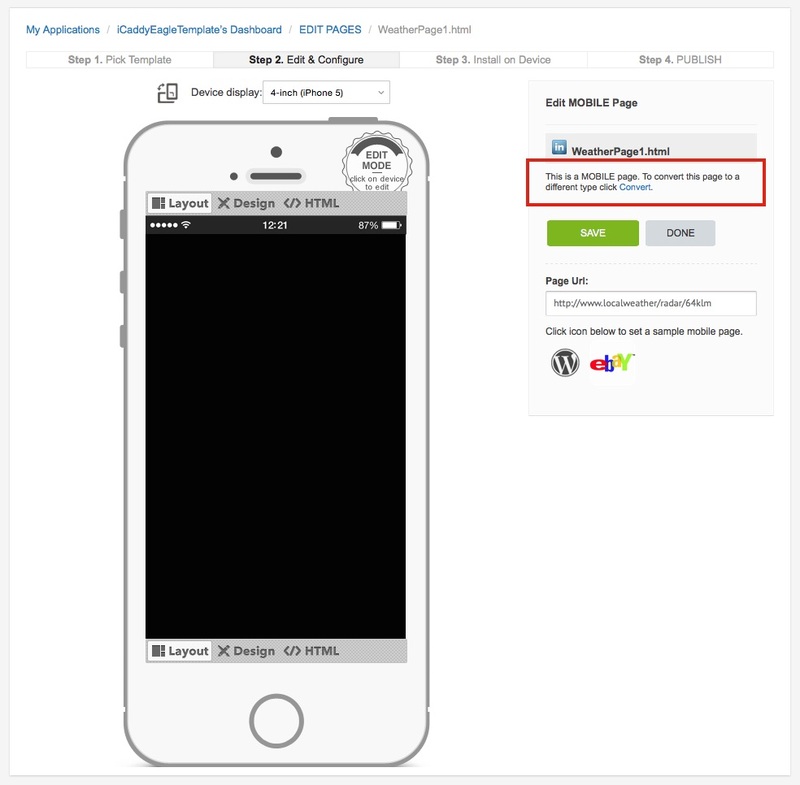 If you wish to use a 'Weather Widget' instead of a website link, the first step is to convert the page from a 'Mobile' page to a 'Blank HTML' page. Click on the 'Convert' link (as shown above) and the 'Convert page' screen will open (as shown below). 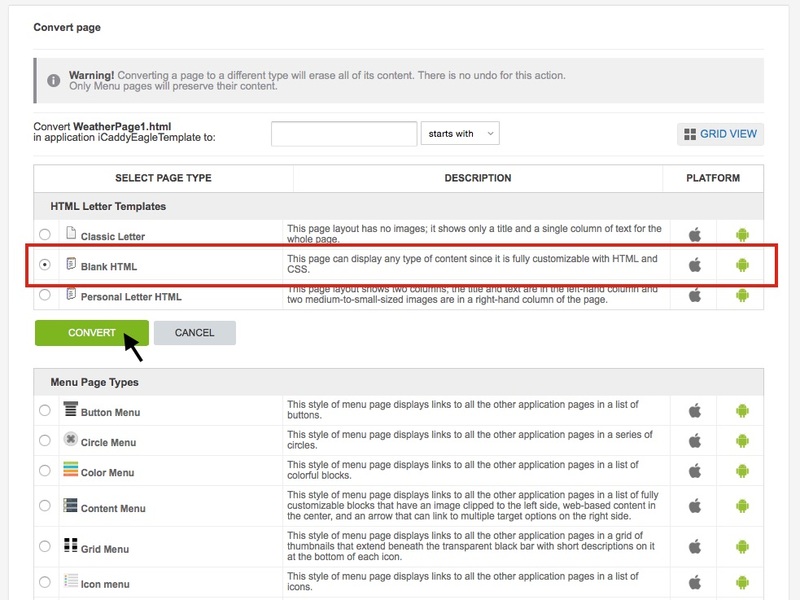 In the 'SELECT PAGE TYPE' column, select the 'Blank HTML' page and then select 'CONVERT' (as shown above). The 'Edit HTML Page' screen for the 'Weather Page' will appear (as shown below). Click on the 'HTML' option as depicted above to enter 'HTML Editing Mode'. You are now ready to add a HTML 'Weather Widget' to the page. Locate your preferred widget online. 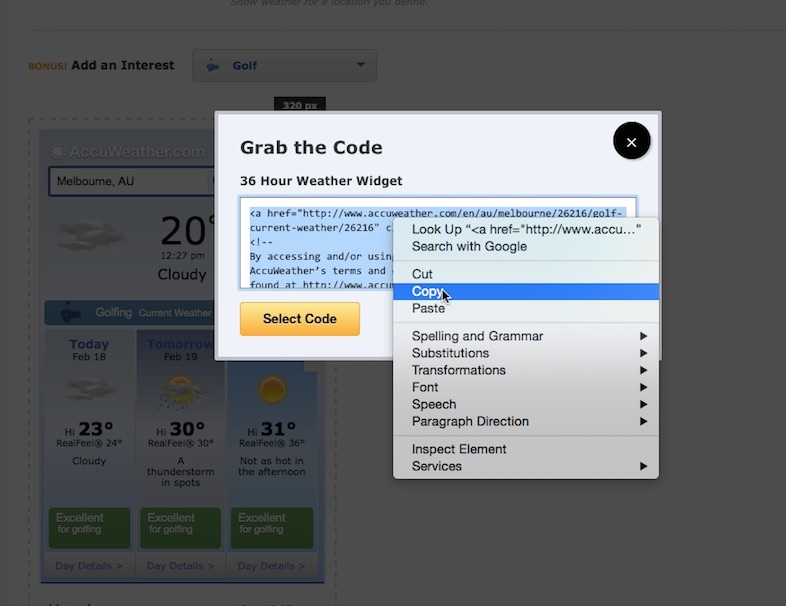 A range of free 'Weather Widgets' can be found by conducting a standard internet search for a HTML weather widget (for your Club's particular location). 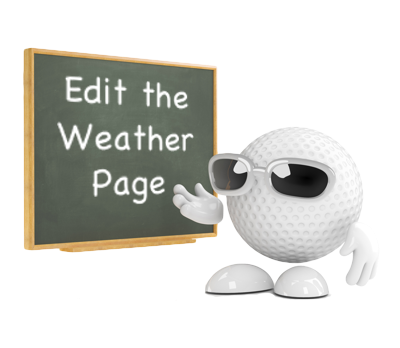 Most HTML 'Weather Widgets' can be customized to provide weather information to suit your Club's location. Some widgets can be customized in other ways including pixel width, number of forecast days etc. 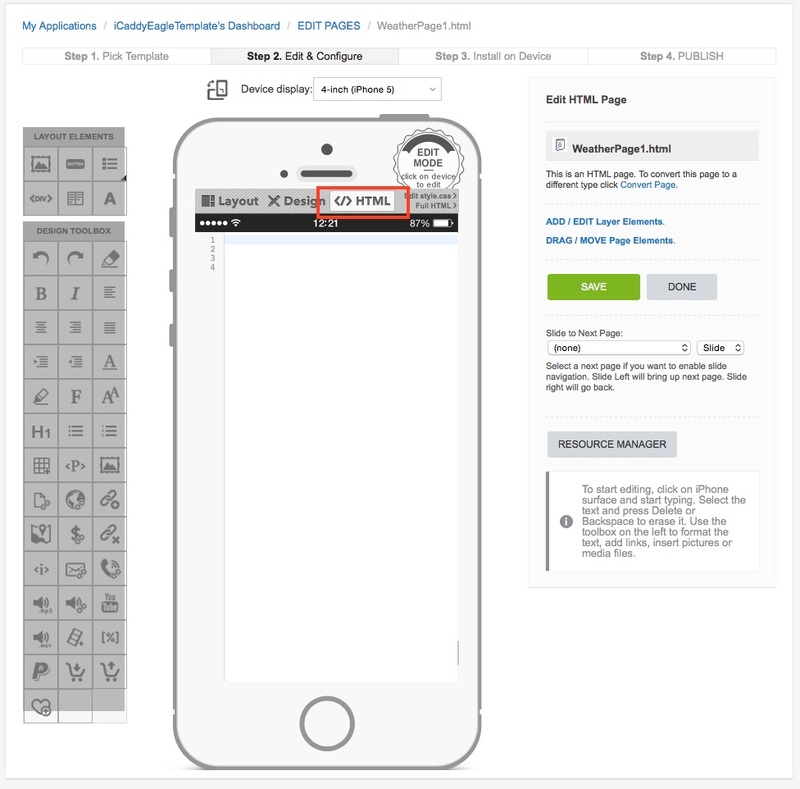 For best results, find a widget that allows you set the width at 320px (or a widget that auto-sizes to fit the device's display). After editing / customizing your preferred widget (if required), copy the widget's HTML code (as shown in the example above). You are now ready to paste this code into your App's 'Weather Page'. Return to the 'Edit HTML Page' screen for the 'Weather Page' in your App. Make sure you are in 'HTML Edit Mode' (as described in Step 3 above). Left-click on the 'Handset Display' screen. 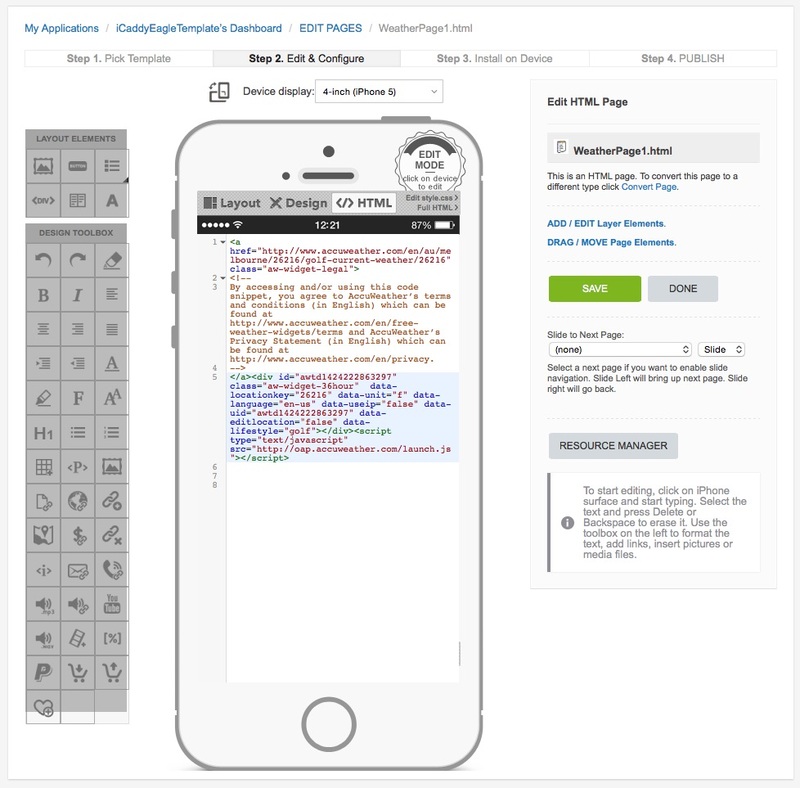 Right-click and then paste the code into the top of the HTML page (as shown above). Click 'SAVE', then click 'DONE' to return to the 'EDIT PAGES' screen for the App (as shown below). Wait for the widget to load. The 'Weather Widget' will be displayed on the 'Handset Display' on screen. Your 'Weather Widget' has been successfully installed. Note: Some widgets may not function correctly in a mobile application. Please check that your chosen 'Weather Widget' works as expected, by using the iCaddy Apps Previewer. For further information on using the Previewer, refer to How to Download the iCaddy Apps Previewer and How to View Your App on the iCaddy Apps Previewer. If you experience difficulties with the chosen widget, simply find another one online that provides the desired functionality as required - there are many to choose from.